Bike lanes on El Camino Real through Menlo Park? 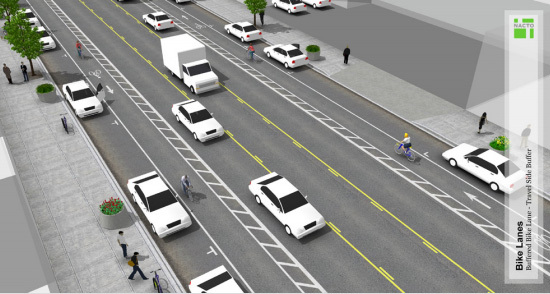 Buffered bike lanes are being considered for El Camino Real, Menlo Park. 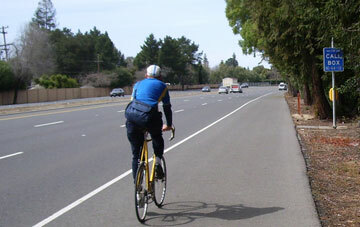 There’s a move afoot to add an experimental bicycle lane and accompanying buffer on El Camino Real through Menlo Park. The experiment may last for six months or a year, yet to be determined. I don’t have a problem with the experiment, but don’t expect miracles. I used to live in Menlo Park, but I hardly ever rode my bike on El Camino Real through Menlo Park, or to downtown for that matter. It was traffic-crazy. I had to contend with a million driveways and lots of cars going in and out. The intersections are jammed most of the day. It’s bike unfriendly to say the least. Adding the bike lane does not remove the hazards of cars entering and exiting driveways or turning right or left, which I consider a greater threat than being hit from behind on a straight section of El Camino Real. I see the biggest advantage coming from slowing car traffic, and more drivers avoiding that stretch of El Camino Real. Whatever the outcome, we need to be thinking long-term about accommodating bikes on roads. I’m talking about 50-100 years. It’s going to take that long for things to change. The big improvement will come once autonomous cars arrive and it’s safe to ride a bike. 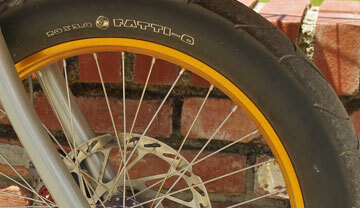 That combined with electric bikes that make riding easy will change how we get around forever. Let’s not forget that the Bay Area is unique compared to the rest of the U.S. where they have something called weather. There is no weather to speak of here (heat, cold, snow rain), so local cities have a much more compelling reason for accommodating bikes on roads to ease traffic congestion. Early commuters. 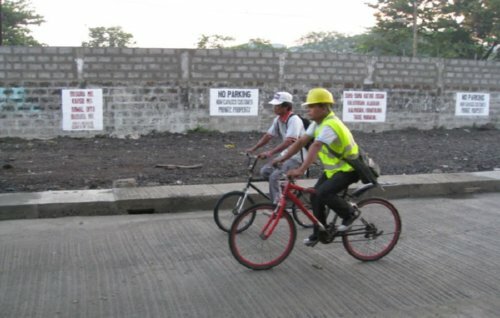 Cyclists ride through Napindan on their way to work in Taguig, Metro Manila. In the Bay Area we can’t complain about the weather as a reason to avoid the bike commute. Still, some do. They say it’s too hot, too cold, or it rains. Ask people living in Minneapolis or Manila about too cold or too hot. They have a legitimate excuse. Even though Manila, Philippines, has some of the worst possible weather for bike riding, horrendous traffic, and air pollution, bikes are everywhere to be seen. If you think it’s because the riders are environmentally aware, you need your head examined. The only reason most anyone rides a bike in Manila is because it’s affordable. Filipinos do ride bikes for pleasure though. On the recently opened C6 you can see cyclists out riding for enjoyment at 6 a.m. Riding is bearable in the early morning and after a rainstorm. Next time you’re complaining about the Bay Area’s weather, think for a moment about the less hospitable places on the planet. The Bay Area is Shangrila. A common refrain about not riding to work includes “I live too far away.” However, most people don’t live too far from work, if you believe the studies. My rule is that I live within one hour of work, which could include taking public transit. What many people don’t consider is combining public transportation with cycling. Now there are limits, for sure, but if you can get to work in an hour using public transit and cycling, go for it. All public transit agencies in the Bay Area accommodate bikes, but the service varies. 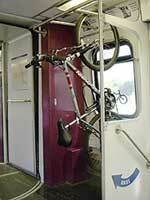 Caltrain offers a place to store your bike on board, as does VTA (Santa Clara Valley Transportation Authority) light rail in the South Bay, but BART doesn’t allow bikes during peak commute hours. Almost all buses have bike racks. Even ferries take bikes. For two years I took an express bus on El Camino Real between Palo Alto and Sunnyvale to get to work. Most of the time there was plenty of seating, and there was always room for my bike. Only once or twice the bus broke down or didn’t show up, so it was reliable transportation. A benefit of taking public transit is that you have time to read, listen to music, sleep, or watch the world go by. When you’re driving you don’t have that luxury. Public transportation is also safer than driving. Most people who don’t ride a bike on weekdays complain about car traffic. Yes, it’s bad everywhere, but if you leave early, or late, you can avoid the rush hour. I leave between 7:00 and 7:15. I’ve noticed that there’s a lot more traffic at 7:15 than at 7:00. This avoids the rush hour, which generally runs from 7:30 – 9:30. You can leave around 9:45 or later, to avoid traffic, if you like to work late. Leaving early brings huge advantages. You ride when it’s cool, the bathrooms at work will be empty, there won’t be as much wind, you get off earlier when there won’t be as much traffic on the return trip, and it won’t be dark in the winter on the ride home. Of course, if you live in Alaska, you’re out of luck. The worst time for early riding is before daylight saving time, when it’s dark in the morning at 7 a.m.
Insulting signs like this one on Page Mill Road typify hostility to cycling. Greg McQuaid photo post. We need only look at the crazed motorist in San Francisco who mowed down four cyclists on Thursday, June 3, as evidence. What’s more disturbing, and does not surprise me, is the public reaction. Some 54 percent expressed outrage, but 23 percent laughed or were thrilled by the incident, according to an NBC Bay Area web poll. I’ll never forget the time at the Summit Store (off Hwy 17) when some mountain rednecks drove up in their truck and saw us with our bikes. “More victims,” one said in a surly voice. They won’t keep me from riding. That said, if you’re new to riding, start slowly. Ride every weekend for at least a month. Ride your work route on the weekend so you can familiarize yourself with the road. After that, only ride to work one day a week — say on a Friday — when traffic is usually light in the morning. Looking at raw numbers, cycling is much less dangerous than driving a car, and only slightly more dangerous than flying a commercial airline, easily the safest form of travel. However, when you factor in distance traveled, journeys, or hours, it’s a different story. Cycling becomes more dangerous than driving a car — from a statistical perspective – but not by a lot. Motorcycles, as we know, lead the way by an order of magnitude. Here’s another more recent study using National Safety Council estimates based on data from National Center for Health Statistics—Mortality Data for 2017. This study puts cycling in a better light, but it’s still way more dangerous than flying commercial. Passenger bus is not mentioned, but it’s extremely low, in the range of airline travel. Having ridden some 115,000 miles, I have become accustomed to riding in traffic and the all-too-common “close call” doesn’t phase me. With experience, you will learn to anticipate hazards, such as parked cars (doors opening unexpectedly), slippery wet paint lines, and people talking on the phone while driving. I learned through John Forester’s “Effective Cycling” that the safest cycling is for cyclists to act and be treated as drivers of vehicles. In other words, when I want to turn left, I merge into the left-turn lane when it’s safe to do so. I obey all traffic laws, including stop signs. Another tip about riding in traffic: think of the times you see cyclists while driving. It’s no big deal to pass a cyclist, unless the road is extremely narrow. Even at night, if the cyclist has a light, it’s usually hard to miss a cyclist. In other words, you’re not invisible, although thinking that way will help avoid collisions. As with driving, the drunk or drugged driver is the cyclist’s worst road hazard. That’s an important reason why I don’t like to ride at night. The easy solution is to keep a garment bag at work. My situation is trivial because I don’t sweat much, so I wear my dress shirt on the ride to work. 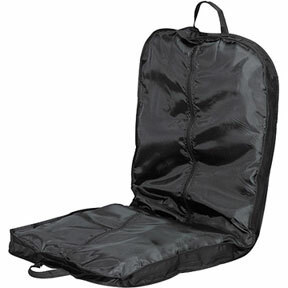 The garment bag stores five pair of pants. Every once in a while I’ll drive to work and take them all home to be washed. You can also take home one pair at a time, if you never drive. When you arrive at work, change your pants in the bathroom. Done. Note that cycling clothing, while fashionable on the bike, is well, er, a bit racy in the office. You can buy some mountain bike shorts that look like cargo pants, in place of racing shorts. Of course, if you like looking racy in the office, go for it. Rest assured, you will get comments. You may have issues with a long commute and sweat a lot, preventing you from wearing your work shirt on the ride in. In that case, bring in a week’s supply of shirts, or longer time period, on your Monday drive in. Drive home on Friday and take your clothes with you. What you don’t want to do is wear slacks! I tried that and it wasn’t long before I had holes in my pants. When I see a professional photo of a cyclist wearing a suit, I roll my eyes. Let’s get real here! Women, unfortunately, may feel hemmed in by fashion. How you live your life is your choice, but many noted women cyclists, such as Jacquie Phelan, Denise Caramagno, and many others, rewrote the rules on women’s fashion and haven’t let clothing considerations get in the way of enjoying life on the bike. Tom's deodorant is my favorite. We begin our “Excuses, Excuses” series with a common refrain, “I sweat a lot and I will smell if I ride to work.” Heard that one before? I can understand the paranoia surrounding bromhidrosis. Personal hygiene is a multi-billion dollar industry — playing off our fears. These fears are unfounded. If body odor is an issue, believe me, someone will let you know. Here’s why it’s not so much a concern as you think. Two types of sweat are produced: by nerves and by exercise. Nervous sweat has a bad odor, but body sweat from exercise, not so much, if at all. However, bacteria like sweat and they’re what cause body odor. 1) Leave early when it’s cool, around 7 a.m.
2) Don’t ride hard. Save the hard riding for heading home. 3) Keep a washcloth and a towel at work. Clean up in the bathroom at work. It’s going to be early, so the bathroom will be empty. If you have a shower at work, that’s a convenience, although it will take longer than using a washcloth. 4) Wear a clean jersey, if you wear cycling clothes. 5) Use deodorant. I like Tom’s natural unscented. Perfume or cologne is another option.